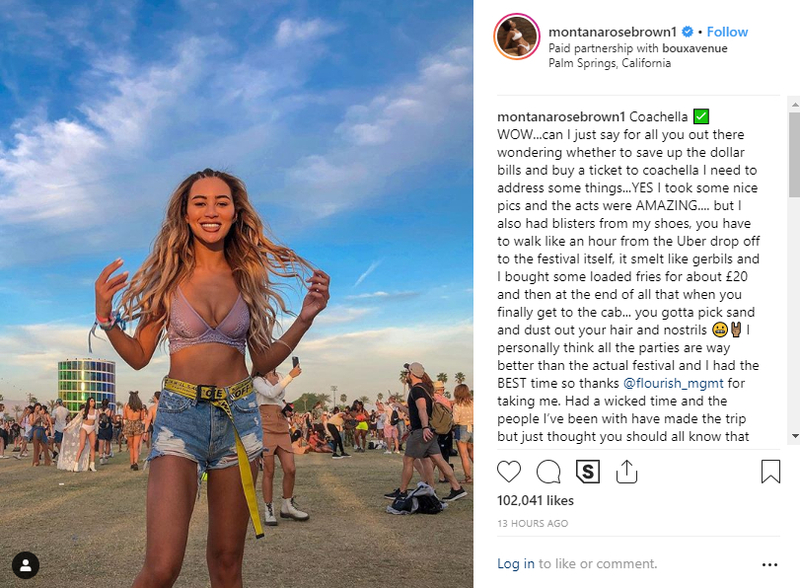 Montana Brown has said the Coachella festival “smelt like gerbils” and she was left with sand and dirt in her hair and nostrils. The Love Island star said she wanted to let her fans know that the event in Palm Springs, California, is not as glamorous as it looks in case they were thinking about saving up to go. “YES I took some nice pics and the acts were AMAZING … but I also had blisters from my shoes, you have to walk like an hour from the Uber drop off to the festival itself, it smelt like gerbils and I bought some loaded fries for about £20 and then at the end of all that when you finally get to the cab … you gotta pick sand and dust out your hair and nostrils. “I personally think all the parties are way better than the actual festival and I had the BEST time so thanks @flourish_mgmt for taking me.